Kevin Owens is now a member of the New Day. WWE wrapped up the Superstar Shake-up with the second half concluding on SmackDown Live. Major superstars like Roman Reigns, Elias, Bayley, and many more moved to the blue brand. But the major story coming out of the episode was the New Day recruiting Kevin Owens as an honorary member. 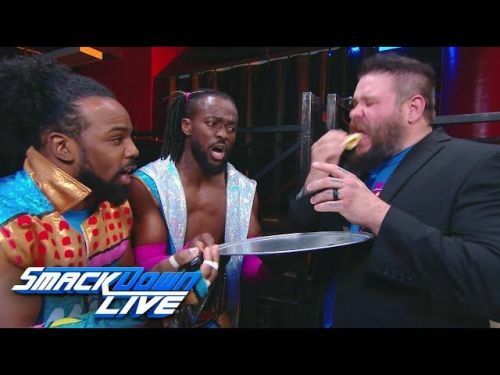 Owens was put through a screening process to earn his 'honorary' slot in The New Day. Owens passed them all and even voiced their entrance. It remains to be seen what the future holds for Owens. Here are 5 reasons why Owens joined the New Day. Kevin Owens came back from injury earlier this year. Vince McMahon replaced him with Kofi Kingston and gave him a title shot at Daniel Bryan's WWE Championship. After he failed to win the match, he was removed from the title scene and has since remained directionless. Owens didn't even make the WrestleMania card even after challenging for the WWE championship a month prior and wasn't even featured in the Andre the Giant Battle Royal. It has been a while since 'Big O' was a central part of any storyline. His inclusion in the group has provided him a direction to follow for the immediate future until Creative comes up with something more for him. The New Day has always been a trio. They have won their titles together and have gone from being extremely disliked to one of the most popular groups in recent times. They even won and defended their titles under the Freebird rule. It's hard to imagine New Day without Big E but an injury has forced him to stay away from the group. This has left a huge gap in the New Day as their powerhouse is no longer with them. Owens was brought in to fill that role in the interim.